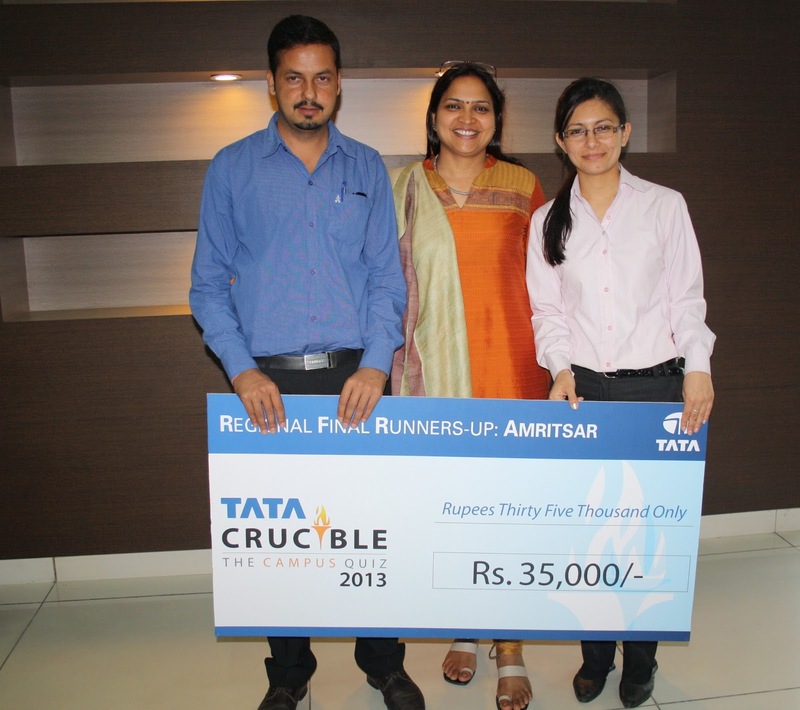 Jalandhar: Recently, the ninth edition of India’s largest inter-collegiate Business Quiz-the Tata Crucible Campus Quiz 2013 Punjab round was held at Amritsar. During breathtaking combat of intellect among 58 teams across Punjab, sharp brains of LPU, Kunica Negi and Balvir Soni of MBA (Hons), won Punjab Final Runners-up prize. LPU team was honoured with winning prize of Rs 35,000 along with other exciting gift hampers worth Rs 10,000. LPU’ team, along with 3 other teams, was selected for state final, after a preliminary written and a subsequent wild card round. The quiz was hosted by ace quizmaster Mr Giri Bala Subramaniam also known as Pick-brain and who holds seven Limca records for quizzing achievements. 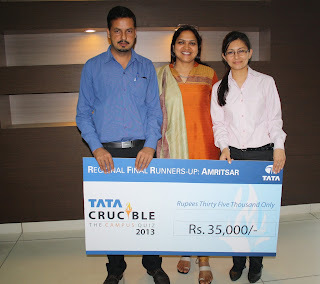 'Tata Crucible – the Business Quiz', which is organized by Tata Group on the annual basis, seeks to bring together sharpest young minds of the country. Started in 2004, it has now become an eagerly anticipated annual event. This Quiz is held separately for Campus students, employees of Tata companies and Non-Tata Corporate. This competition has also been taken outside India and is running successfully since 2007 in Singapore and since 2008 in the UK. The mega International Final of the Campus Quiz 2013 will be organized in Mumbai. Congratulating the winning team, LPU Pro Chancellor Ms Rashmi Mittal emphasized upon the importance of collaborative effort and willingness to learn from others while working in a team: “It is matter of pride for us to see our students excelling others in this world of competitions at each and every step. To ace such organizations one needs not only knowledge, but also the ability to articulate learning in the right manner. Our team has revealed alertness of mind undergoing all essential facts and figures.” Ms Mittal also demanded of other students to continue this journey for future success stories on national and international daises. We have great opportunity to get benefited from these colleges. The personal statement business studies is also supporting us in business field. Are you looking for latest iPad Mini 5? Apple iPad Mini 5 is all set to take the world of technology by a storm with its extraordinary features. The OLED display which is expected to be one of the features is definitely going to be the highlighting characteristics of the device which is estimated to hit the market before the end of the year 2017. Nice information. i am looking SAP HANA Online Training with real time project.